All knives stamped with a cursive Carter and three star mitsuboshi are hand-forged, annealed, heat-treated, and hand-sharpened personally by the 17th Generation Yoshimoto Bladesmith and ABS (American Bladesmith Society) Master Smith himself, Murray Carter. Watch him tell his story in this video, Portrait of a Bladesmith. Muteki knives are forged by graduates of Murray’s rigorous and uncompromising three month Apprentice Program in which the applicants must demonstrate the correct attitude and aptitude for traditional Japanese bladesmithing. The select few who rise to the level of a Muteki bladesmith must be able to consistently produce high-performance blades following strict traditional methods and must embody a deep reverence for the craft. Read more about our Muteki Bladesmiths here. What are the differences between Carter and Muteki knives? The main difference is that Carter knives are forged by Murray Carter, a 17th Generation Yoshimoto Bladesmith and ABS Master Smith with over 30,000 blades forged over a 28 year career (as of 2017), while Muteki knives are forged by Murray’s qualified journeymen bladesmiths under Murray’s supervision. Carter knives are precision forged to within 95% of their final shape, heat treated in a pine charcoal fire, and have all the metallurgical work done personally by Murray. Carter knives include premium handles with contrasting liners, mosaic center pins, and the famous scary-sharp “Carter” edge that Murray does by hand. Carter knives exhibit artistic handle design utilizing premium synthetics and exotic woods ranging from G10, carbon fiber, Micarta, and natural stabilized woods. Muteki knives are forged to within 80% of their final shape. They are heat treated in a coke fire. The work is done by Muteki journeymen smiths under Murray’s close supervision. They include hand-sanded handles made of traditional materials and riveted pins. In simpler terms, the Muteki series offers the incredible cutting performance Carter Cutlery is known for at a competitive price point. What is Traditional Japanese Bladesmithing? When Murray refers to traditional Japanese bladesmithing, he is specifically talking about the centuries old process of heating simple, high carbon steels in a solid fuel forge and laminating that to softer iron at the lowest possible temperatures in a process known as forge welding, and then hammering the steel with the intention of purifying and refining it. That is followed by a unique annealing process wherein the heated blade is inserted into rice straw ashes to cool slowly. To increase the overall performance, the blade is hammered cold before quenching, a process known as cold forging. The blade is then coated in a unique clay slurry, heated again in a solid fuel forge, and then quenched in lukewarm water. Blades that survive the extreme quenching process are then arduously ground on slow rotating water stones to optimum edge geometry and then hand honed to a true razor’s edge. All of our knives are made with laminated steel. In traditional Japanese fashion, we use sanmai (three layer) construction and kataha (two layer) construction. Murray has worked exclusively with Hitachi White Steel as the core of his knives in the past, but he now works with both Hitachi White and Blue steels, the cleanest cutlery steel in the world when it comes to contaminates such as sulfur and phosphorous. The outer laminates can range from SUS410 stainless steel, mild steel (gokunantetsu), 1035 high tensile steel, or Damascus layering. Watch this video for more information on what steel Murray prefers. What types of sheaths do you offer? 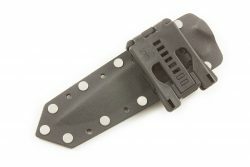 Our sheaths are made from kydex and come in a variety of styles. 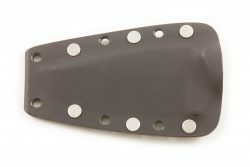 Most of our neck knives come with a pre-made neck sheath, but other sheaths can be ordered. 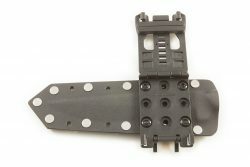 A horizontal belt sheath is $35 and comes with your choice of 3 different sizes of nylon loops (1.25”, 1.5”, 1.75”). 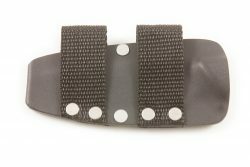 An inside-the-waistband sheath is $35 and has a kydex clip that goes around the belt, while the entire sheath is designed to sit inside the waistband. Our FS1 knives come with a tactical sheath with a Tek-Lok system. We can make these sheaths for other knives at a cost of $50. 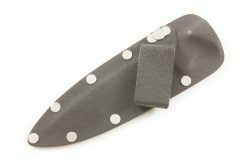 Additional neck knife sheaths are $25. In most cases, we can make sheaths for knives from other makers. Please contact us directly for more information. What do the different marks on the knives mean? Mitsuboshi Trademark symbol for “three stars,” registered in the 3rd year of the Keicho Era (1598). Originally shown as 3 circles because to the founding Yoshimoto bladesmiths, stars in the sky looked like little round dots and not the 5 pointed geometric shapes we have come to know in North America. It has been modified in our current logo to reflect the way the stamps usually look in a forged blade when the hardened stamp is hammered into the softer blade at a slight angle, resulting, ironically, in something resembling a moon. Hon ke “Original Location” or legal owner of a business. Indicates a Hitachi White Steel #1 core. No longer in use. Indicates a Hitachi Blue Super Steel core. No longer in use. Indicates a forge welded blade in my own shop Honwarikomi or Honkasumi. No longer in use. How do I care for kurouchi knives? Although kurouchi knives do not resist oxidation as well as stainless knives, any discoloration will not affect performance. If you do not like the patina that your knife develops, then it can be removed by sharpening. Kurouchi knives should be treated with the same respect as other high-performance kitchen cutlery — dried after every use and stored safely so it does not bump into anything. If there is going to be a long time between uses then we recommend using non-toxic oil on the knife to prevent rust. Cooking oils are a good choice since they are safe to consume. Can damaged knives be fixed? If you chip one of our blades, with our DVD instruction and sharpening stone set, you can learn to repair it yourself, but you may also return the blade to us and we will repair it for a small fee. Sharpening does not affect the performance of the blade and is a regular form of maintenance for Japanese style cutlery. How do you recommend sharpening knives from Carter Cutlery? We recommend the use of Japanese water stones to sharpen all cutlery (especially ours). Sharpening your knife is an essential part of owning high-performance cutlery and will truly make the knife “yours.” In theory, sharpening is quite simple. However, in practice, it requires patience and experience to become proficient. For those that would like to learn freehand sharpening, we hope you will consider our award-winning Sharpening Instruction Videos. You can also sign up for our Free Knife Care and Maintenance Tips in which we cover the 7-step knife sharpening procedure and give you one free knife sharpening. What is your knife sharpening service and how do I use it? Please include a note with your contact information, return shipping address and any special instructions. Be sure to package your knife in a sturdy box with something protecting the tip and edge of the knife. You may include payment with the knife – the fee is $20 per knife plus $10 for shipping and $20 for each additional knife. Alternatively, let us know ahead of time that you are sending us your knife for sharpening and we can contact you after the work is complete for payment information. What if the knife I want is sold out? Our knives can sell out very quickly. Each knife is unique so when you see one that is right for you, grab it before it’s gone! The best way to keep up with new products is to subscribe to our New Product Alerts, which will automatically send a summary of the knives that are listed to you via email. Can I come visit the forge? People are always welcome to visit our storefront. We are open Monday through Friday from 8:30 AM to 5:00 PM. However, we are unable to have visitors inside the forge except by appointment. The best way to see the forge is to visit us during one of our Open House events, which are posted on our Events page and posted on our social media monthly. Please contact us for any other visitation inquires. Do you have any openings in your Muteki Apprentice Program? Carter Cutlery is always on the lookout for new, gifted talent. However, the physical limitations of our facilities dictates how many apprentices we can teach at any given time, and therefore we select only the most dedicated applicants. Those serious about apprenticing with Carter Cutlery should follow a Four-step application procedure. First, purchase Murray’s complete Media Package in which he shares all of the essential Japanese bladesmithing tips and techniques. $100 of the cost will be gifted back to the graduates of the Muteki Apprentice program. Second, submit a one page cover letter with resume and include photographs of anything you have crafted with your hands. Third, if you aren’t already sharpening knives by hand on Japanese water stones, start right away. Some of the most important lessons in bladesmithing are self-learned by spending hours on the stones. Murray would also like you to send him pictures of what you have sharpened for review. Fourth, spend some time sketching practical blade designs on paper and submitting them, along with a progress report on hand sharpening to Carter Cutlery via email every 30 days or so after the original application is submitted. Does Murray or any of the Muteki bladesmiths sharpen katanas (swords)? We get many inquiries about appraising or sharpening authentic Japanese Samurai swords and blades. From a purely practical standpoint, Carter Cutlery can straighten, regrind, polish and sharpen one of these blades for a modest fee. However, truly valuable or historic blades should only be serviced by a certified Samurai sword blade polishing expert. A resource for this service in North America is the Nihon Bijutsu Token Hozon Kyokai (NBTHK) in California. Can Murray make introductions for me to bladesmiths while I am in Japan? Murray hosts annual tours to Japan for paying clients whereupon he introduces the best names in the industry to his travelers. Outside of this tour, Murray is reluctant to make any recommendations to casual inquirers that he is unable to personally vouch for. The Japanese take personal introductions very seriously and therefore recommendations have to be made with reverence and commensurate respect. We would be delighted to have you join our next guided tour and make these introductions for you in person. Here is a link for things to do in Japan! What is the difference between blue super steel and Hitachi white steel on FS1s? The idea with the blue super and 1035 spring steel is that it is practically indestructible; also, the strength per weight ratio is the strongest we offer. The white stainless gives you a keener edge and sharpens easier; the stainless steel makes it easy to maintain, but typically, we leave them heavier to compensate for the fact that the laminate is not as tough as the blue super 1035 combination. Where can I find information about Carter Cutlery company policies? What is Muteki Zen knives? Our Muteki Zen series is an avenue for the Muteki smiths to make knives outside of our standard laminated construction. The Zen knives feature homogenous high carbon steel blades, using a potential variety of steels such as 52100, 1095, or SK-5. These knives are all forged using a coke fire, with the primary focus being superior metallurgy and cutting performance. However, some steels may undergo different heat treating methods than white or blue steel; for example, oil quenching or oven tempering. These knives may also feature differential hardening, hamons, or integral bolsters depending on the desires and experience of the smith. Because these knives may undergo different processes than the traditional methods taught by Murray for laminated blades, we created the Zen line. 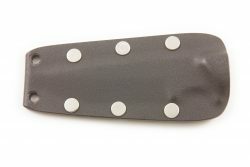 Muteki Zen knives can be identified by the “ZEN” stamped next to the muteki mark on knives.